Prof. Emeritus John Trump, c. 1979. 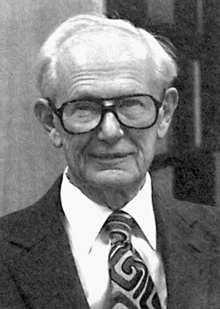 John George Trump (August 21, 1907 – February 21, 1985) was an American electrical engineer, inventor, and physicist. He was a recipient of U.S. President Ronald Reagan's National Medal of Science, and a member of the National Academy of Engineering. John Trump was noted for developing rotational radiation therapy. Together with Robert J. Van de Graaff, he developed one of the first million-volt X-ray generators. He was also the uncle of the President-elect of the United States Donald Trump. Trump was the youngest of German immigrants Elizabeth and Friedrich Trump's three children and their second son. Following Friedrich's untimely death, John was financed through college, from bachelor to doctorate, by his brother Fred, who had joined their mother in real estate development and management while still in his teens (Elizabeth Trump & Son). Initially, the brothers tried working together building houses, but John was a perfectionist who found it hard to compromise on his designs and accept commercial deadlines. The brothers dissolved their partnership, and John pursued a career in electrical engineering. Trump received his bachelor's degree in electrical engineering from the Polytechnic Institute of Brooklyn (1929), his master's degree in physics from Columbia University, and his doctorate in electrical engineering from the Massachusetts Institute of Technology (MIT) (1933). He was a professor at MIT from 1936 until 1973. During the war years, Trump switched from work on hospital X-ray machines, to research into similar technologies with a more direct application to warfare, especially the development of radar. In 1940 he joined the newly formed National Defense Research Committee (NDRC), as technical aide to the Chairman of the Radar Division, and President of MIT, Karl Compton. In 1942, he became Secretary of the Microwave Committee, a sub-committee of the NDRC. The head of the Microwave Committee was Alfred Lee Loomis, the millionaire physicist, who decided to create a laboratory, selected a site for it, chose a suitably discreet and ambiguous title for it and even funded it, until the Federal administration was set up. The new institution was the MIT Radiation Laboratory, or the 'Rad Lab' to those in the know. The British were also working on radar, which they called RDF, but had started much earlier. Their Tizard Mission to the US, showed how far ahead they were in some of the technologies, particularly the magnetron, and it was decided to send a US team to Britain to help coordinate the efforts of the two Allies. The unit was known as the "British Branch of the Radiation Laboratory" (BBRL) and operated as a department of Britain's Telecommunications Research Establishment (TRE) at Malvern, in Worcestershire. From February 1944 to the end of the war in Europe, the Director was John Trump. During this time he also served in the Advisory Specialist Group on Radar, advising USAAF General Carl Spaatz on navigational radar, precision-bombing radar and also defenses against the German radars found in their night-fighters and in their flak units. The systems included: Gee, Oboe, LORAN, H2X, MEW & SCR-584. Trump worked with all the leading British radar experts, including Sir Robert Watson-Watt, A.P. Rowe and Bernard Lovell. At the end of the war Trump also had interviews with Germany's leading radar technicians. Trump received recognition for his war-work from both the United States and the United Kingdom. John G. Trump was survived by three children: John Gordon Trump of Watertown, Mass., Christine Philp of Pittsfield, Mass., and Karen Ingraham of Los Alamos, N. M.; and six grandchildren. His nephew Donald Trump was elected President of the United States in 2016. In 1946 Trump, Robert J. Van de Graaff, and Denis M. Robinson founded the High Voltage Engineering Corporation (HVEC) to produce Van de Graaff generators. He died in Boston on February 21, 1985. The National Academy of Engineering called Trump "a pioneer in the scientific, engineering and medical applications of high voltage machinery". ↑ "Sewage Problem Solved". Spokane Daily Chronicle. 21 May 1977. Retrieved 19 Aug 2015.